INTRODUCTION: When I heard about In the Courts of the Sun which was announced as thriller involving Maya prophecies and the end of the world in 2012 when the known Maya calendar stops, I was intrigued by the cover and the references to the action taking places partially in the heyday of Maya civilization. So I got the book and the first page just hooked me, and I could not read anything else until I finished it. OVERVIEW: In the Courts of the Sun is the first volume of the Sacrifice Game trilogy. It contains two major threads that are linked by the aforementioned Maya Game, one taking place in the near future of 2010-2012, one taking place in the heyday of the Maya civilization of the 660's AD. Both threads are first person and they are narrated by Jed de Landa; well it actually will be Jed and Jed(2), but read on to see the how and why. Born in 1974 and displaced from his native Guatemalan village by military action, Jed is taken as a young age to the US and grows up in foster care in Utah, exhibiting physical frailty since he suffers from hemophilia so any wound or cut is potentially fatal, while showing great mental agility especially in fast numerical computations and ability to play games of skill and chance. The Game that is the crux of the novel is a very sophisticated version of a "chase on the board game", where one opponent has many slower/weaker pieces, while the other has fewer fast/powerful ones. However there is a twist: the original Maya expert "sun adders" played the game as a ritual on a calendar board and at the highest nine runner level, its results were supposed to predict events in the future. Since the Maya calendar ends on the symmetrical 12/21/12 date, and since the discovery of a Maya Codex in which a famous game played in 659 AD forecasts 12 disasters of increasing magnitude across time, some people take the game very seriously. Ten of the catastrophes have already happened in the intervening centuries, the 11th is "scheduled" for December 28, 2011, with the "biggie" on 12/21/12. Of course the disasters have precise dates but otherwise the descriptions are cryptic, though all the 10 known ones are by man - the game predicts people's interactions, not natural events - and are clearly documented, the last being a nuclear disaster at a particle accelerator in 2010 in which 30000 people died. In the present day the few "adders" that play the game like Jed who is most likely the best in the world, are puny players, hardly managing more than one stone games - and the magnitude of difficulty increases factorially, so a 4 stone game is 24 times more difficult than a three stone one, while a five stone is 120 time more difficult than a four stone one. Even the best and most sophisticated software run by Jed's mentor, professor Taro and his employers at the secretive Warren corporation barely manage 3 stone level. Though even at a 2 stone level, the prediction results enable Jed to make a very comfortable living living trading futures, while the Warren corporation managed to avoided bankruptcy using the Game and now is making tons of money since Taro and Jed's work entered full production. But the billionaire mormon CEO of the corporation combines ideology with philantropy and the profit motive so as he puts it "avoiding the end of the world is definitely not only philantropic, but good for profits too" and he is willing to pour unlimited resources in off the wall projects, including the one that will transport an instance of Jed's consciousness in the past, to be received by the unwilling brain of a local. The idea is of course for Jed(2) to learn as much possible about the game, write down the results on stone tablets and entombed with radioactive markers to be excavated "now". In the Courts of the Sun stands at about 700 pages divided into four parts, with a prologue and a segue into the next novel. There are several maps, a Glossary of Maya terms, and extraordinary beautiful Maya glyphs and drawings scattered throughout the book. You can see several in the pages linked above. The ending of the present day thread is just astounding and makes me want the next book asap, while the Maya part stops at a natural point. The present day action starts on December 23 2011 and occupies part 1, part 4 and the epilogue, while the Maya one starts in 664AD and occupies the prologue and parts 2 and 3. 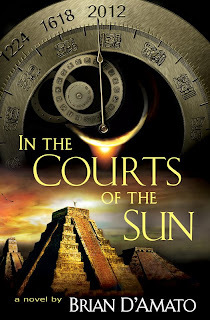 ANALYSIS: In the Courts of the Sun turned out to be one of the most unexpected books of 09 for me in quality and enjoynment and it will feature prominently on my best of year lists for two main reasons that elevated it above usual "mysterious artifact/prophecies" thrillers or mysteries. “It worked, I thought. Holy mierditas. It isn’t 2012. It’s 664. And it’s March 20. Or in Maya reckoning, it’s 3 Earth Rattler, 5 Rainfrog, in the eleventh uinal of the eleventh tun of the eleventh k’atun of the tenth b’ak’tun. And it’s about 4:48 A.M. Sunday. Unbefarfreakingoutlieveable, I thought. They actually got it right. New bat time, same bat place. Not that I was actually in the same place in the universe, of course, if that even means anything. The solar system moves a lot in 1,347 years. But I was in the same spot on earth. I was still in a tiny room near the apex of the tallest pyramid in the city of Ix, in what would later be called Alta Verapaz, in central Guatemala. But now the sanctuary was orange with torchlight, and the columns of scarabesque glyphs on the walls were smooth and unpitted and polychromed in black, blue, and cochineal carmine. And now the city was alive. I could hear the crowds outside, or maybe, rather, I could feel their chanting through the stone. The point is that from my POV, I hadn’t moved in space. But I had— "
Then there is the whole Maya thread which is just an unbelievable example in world building that rivals any secondary world fantasy or future alien sf "universes" that I have ever read in sense of wonder and strangeness. And I read a lot of both. While historical, the Maya culture as recreated by the author is so vividly different than ours, so full of sounds, color and memorable characters, from the local "chief" that takes Jed in his new persona under its wing, to the great Game player who played the fateful game of 559 that triggered the whole "trip in the past", now moved from her provincial upbringing to bigger and better things, or maybe riskier and more dangerous ones, as a sort of "heretic but tolerated for now" leader in the capital Teotihuacan, the unforgettable Lady Koh. Since the near future story is Jed's tale, the characters encountered here are less vivid than the Mayans, but there is Marena Park the Warren Corporation's executive in charge of its whole entertainment division, famous artistic game designer, single mother of a hyperactive 9 year old and formerly of Disney World management. Since everything related to the Game: software emulator player, Taro, the Codex, comes under the "entertainment" heading Marena is the boss of Taro and later of Jed. And she is a perfect counterpart to Lady Koh, a modern master of corporate games as well as a very talented artist in her own. If there is a weakness to the novel, I would say that the prologue while extarordinarily vivid as shown above, is also a bit abrupt and it takes a while to fully enter the spirit of the novel and figure out what's what - though how can you not after such an opening? The "canned" villain of the 11th disaster that duly happens on the announced date in 2011 and is even more horrifying than the accelerator disaster elicted a laugh when I found out his identity, but then I sort of thought, well it's just too easy a choice, so that ultimately worked only so-so for me, but these are small niggles compared to the rest. Highly, highly recommended and an extraordinary novel. Wacky, funny, moving. Check the excerpts and the description above and try it!! Thank you for your kind words; I was surprised at how much I liked this one; the wacky narration of Jed just enthralled me. I bought the book on the day it was published several weeks ago, and read it immediately. What mouth watering review. Thanks Liviu! Didn't know before that this book is part of a trilogy. Check out the link through pages and see if you like the style. I just read this book as well and you are right on with your write up about the book. I read the book within one very busy week, not being able to put it down at night. I look forward to the next book. But there were so many illogical mistakes!!! I am enjoying the book wholly and am halfway. I cannot wait for books 2 and 3. I am not a math expert, but if you take the time to think about some of the things talked about, it makes sense. It has a sort of reality and scifi feel to it. Let's see what happens on 4 ahau shall we? Hey Liviu, I was checking this out today. I really want to get around to reading this. When is the next book coming out? after taking control of Cuba, January 8, 1959.
continents to its original state, the so-called Pangea.